Susie Harris: Happy New Year and a Winner!!! First of all I would love to wish each and everyone of you a Happy New Year. Where has the year gone? I was blown away by how many people commented for the giveaway. Yall sure know how to make a girl feel loved and all...even if its because Im giving away stuff, Ha! Guess yall are interested in who the lucky lady is. Well its Miss Jennifer from my life with four kids. Now that lady deserves some free stuff with taking care of four little ones. So Miss Jennifer congrats to you my dear friend! I will be getting in touch with you as soon as I can feed my child some oatmeal. Awwww shucks! I should've known I wouldn't win! Do you paint all of your signs on wood? Just curious! Congratulations Miss Jennifer!!! I will be ordering my signs as soon as I put money in my paypal account. Happy New Year! It's pretty chilly here today! We have the fireplace going. Wishing you all a great year ahead.....give Mark and the kids my regards. Happy New Year and congratulations to Jennifer! Awwwww well congratulations to Jennifer! WOOHOO my sign is being worked on...yay!!! Guess I'll have to wait til next time. Congrats Jennifer! Congratulations to Jennifer, and Congrats to you on your etsy store opening! :) Here's wishing you a wonderfully Blessed New Year! Can't wait to read about your adventures in 2009! Congrats to Jennifer! Thats awesome! Happy New Year, wishing the best for you and yours! Hey, sweet Susieness! Congratulations to Jennifer! The signs are just awesome and you're so talented! Thank you so much Susie, for your prayers and concerns for my Mother. You are so precious to me. Congrats to your winner! I just spent quite a bit of time breezing thru your blog! You have a beautiful family, home and nice business! Oh my, your signs are gorgeous...and what a beautiful family you have! I don't think I have seen your blog before...but I am heading to put you on my "inspirations" list! Congratulations, Jennifer. Happy New Year! 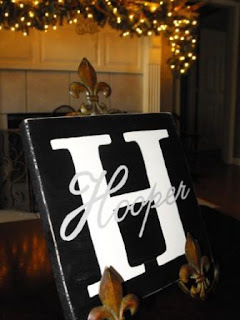 I just ordered the last name initial sign off your Etsy site. I can't wait! It's gorgeous. Wow!! Thanks for all the congrats!! I'm so excited to have won!! You did get my reply email, didn't you?! I hope so, if not, let me know!! I'm so excited!! This is lovely! I bet she will be thrilled!